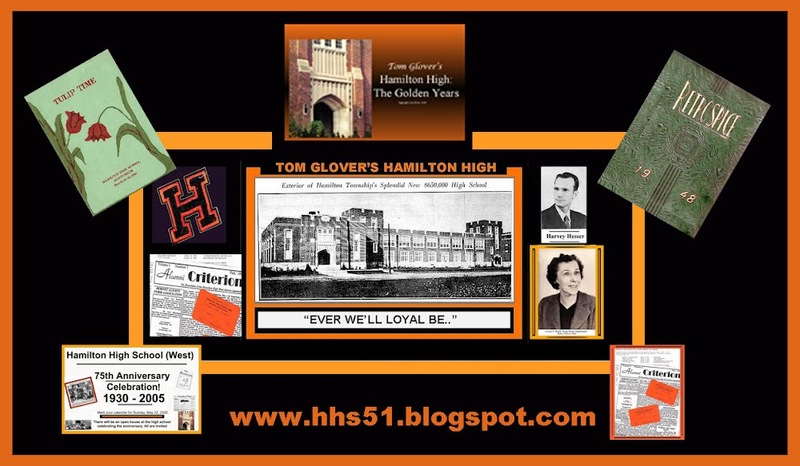 OF MY HHS CLASS OF 1951. WERE WE EVER THIS YOUNG? THIS IS PAGE 1 OF 4 PAGES OF OUR 25TH REUNION AT THE OLD HEIGHTS IN IN 1979. BOB SMITH AND THE LAMPLIGHTERS ADDED TO THE CHARM OF THE EVENING. Again, the worst part of this Class Correspondent job raises its ugly head. Sadly we inform you of the passing of classmate Mattie (Eubanks) Joieck Blackwell...no relation to classmates Jim Blackwell and Barbara (Blackwell) Hendrickson...on 4/13/08. Below is the obituary as it appeared in today's Trenton papers. Published in The Times, Trenton, on 4/15/2008. Wednesday, April 16th at 7:00 p.m. Enjoy an evening musical program presented by Tom Glover in the 45 foot dining room of the mansion. Tom will bring his music on his computer, and you’ll have a lovely evening listening to his love ballads. Guests are invited to join in, by singing along during the entire evening. Tom always presents a memorable evening. NOTE: Tom Glover presents this program on a volunteer basis – and therefore it is not at taxpayer expense. Residents may call 890-3630 to confirm reservations. Regrettably I found this obituary online after Marlene's HHS56 52nd Reunion mailer was returned as undeliverable. I received verification of the bad news tonight from her HHS56 best friend, Krista (Uudna) Tammaru. Marlene R. Turner (nee Vallery), of Willingboro, passed away in Samaritan Hospice Inpatient, Mt. Holly on Friday at the age of 69. Born in Atlantic City, she was a registered nurse for over 40 years and retired from Hampton Hospital in Westampton in 2002. She was an avid soccer fan who enjoyed reading, musicals, and Broadway shows. She is survived by her children, Sondra Sieverson, William Turner, Norma Triebly, Daria Turner, Alicia Turner, Adrienne Meelarp; 11 grandchildren; a brother Robert Vanselous and a sister Marietta Winslow. A memorial service for Marlene will be held on February 27, 2008 at the Christ the King Episcopal Church, 40 Charleston Rd, Willingboro, NJ at 11 a.m. Please send donations to the American Cancer Society. Messages of sympathy may be emailed to her family from www.pagefuneralhome.com. I missed this one yesterday but ever-vigilant HHS56 classmate "Mickey" (Curley) Cartlidge caught it and asked that I send it on to all of you. We've lost another ! Loretta J. (Tureck) Pellegrino TRENTON - Loretta J. Pellegrino, 69, passed away suddenly Tuesday. Born in Trenton, Mrs. Pellegrino was a lifelong area resident. She retired in 2004 from the Hamilton Township Board of Education after 47 years. Loretta enjoyed doing crafts, collecting lighthouses, going to the beach, and traveling. She also enjoyed going to the casinos in Atlantic City, Chester, Philadelphia Park and Las Vegas, but especially loved spending time with her grandchildren. Predeceased by her parents, Peter and Catherine Tureck, her husband, Joseph Paul Pellegrino and her sister, Linda Tureck, she is survived by her son and daughter-in-law, Joseph and Stacy Pellegrino; her daughter and son-in-law, Joan and Terry Barnes; and her grandchildren, James Boggs Jr., and Kami and Joey Pellegrino. The funeral will begin 8:30 a.m. Thursday at the Saul Colonial Home, 3795 Nottingham Way, Hamilton Square. Mass of Christian Burial will be celebrated 9:30 a.m. from St. Gregory the Great Roman Catholic Church, 4620 Nottingham Way, Hamilton Square. Interment will follow in Our Lady of Lourdes Cemetery, Hamilton. Family and friends may call 6-8 p.m. Wednesday at the Colonial Home. Published in The Times, Trenton, on 3/30/2008.